The debut album of Esbjörn Svensson Trio was released in 1993. Generally speaking, the album is like a road map for the trio. In each song, they give a different future plan. The sound is near to the Scandinavian Jazz however what we hear is a work trying to cross the borders around this creativity. We sometimes hear a soft, virtuosic piano playing, we sometimes hear a cold nordic partition or a mainstream jazz improvisation. We even listen to rock music from time to time. It is not their best contrary to the usual trend. They gradually did what they want to do and this album is a very nice beginning. I do not know whether the first-time listeners in 1993 noticed that this outrageous musicians would change the direction of European Jazz and become one of the most sophisticated jazz trio in the world, but when I have listened to “When Everyone Has Gone”, I could get the feeling of a stellar birth of a musical beauty full of modal improvisations and virtuosity. The trio decided to be formed in Autumn 1991 while they were at tour with Swedish jazz singer Lina Nyberg. The record and mixing were made by Bjarne Hansen in Sun Studios, Copenhagen in July 2-4 and September 2 and 3 in 1993. Mastering was made by Digitalfabriken. The album was released by Dragon Records AB from Sweden. The release of the album was with a very small party. Esbjörn Svensson played grand piano, fender rhodes, Roland D 50, Oberheim. Dan Berglund played double bass and performed whistle. Magnus Öström played drums, percussion and performed vocal. When Everyone Has Gone: The title track gives the general structure of E.S.T., which also will shape most of their compositions. The thematic and minimalist entrance, gradually increases tension through the improvisational body (generally triggered by the piano and driven by the percussion) and the ending is same with the theme of the entrance. A melancholy is spread over the piano tone. For the ones following E.S.T. 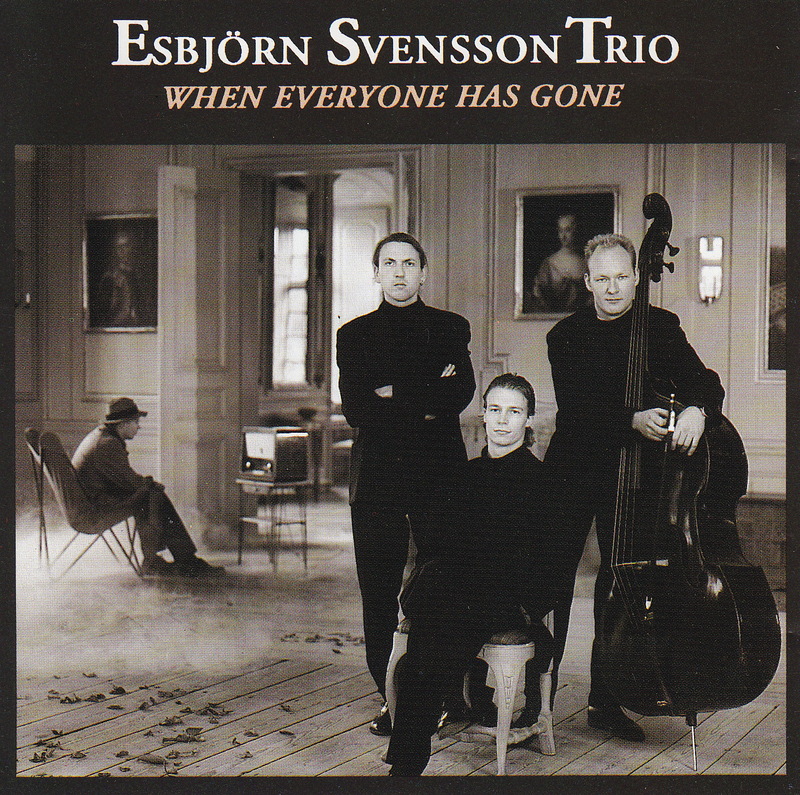 after their ACT albums, I can say that in this album the style of Esbjörn Svensson is a bit more classical (we may call it official) than the following ACT albums. Dan Berglund's tone is very unique and discernible as it is in their ACT albums. Magnus Öström is rather a percussionist than a drummer in this piece. Fingertrip: An extraordinary piano entrance turns out to be the main theme of the song. The name of the song is meaningful considering the dominance of the piano in both composition and improvisation. During his piano partitions, Dan Berglund carries out a walking bass while Magnus Öström is trying to answer Esbjörn Svensson's improvisational attacks (resembling Keith Jarret Trio). At the end of the song we hear the main theme again with a very sudden shift (an E.S.T. classic). Free Four: A constant rhythm of percussion is deeply accompanied by a bass, over which we hear a well-known mode from the piano. This mode is improvised and softened after a while. The bass synchronizes to it whereas rhythm is the same. The ending is as expected. Stella by Starlight: This jazz standard in this album is no way a cover. It is certainly a new arrangement swimming in an extraordinary improvisation sea. In the entrance, the song has not decided on the direction yet. If the audience had still not understood that they are listening to the first album of an incredible trio, I think they would have agreed on that after this performance. 4 a.m : The name of the compositions have clear meanings consistent with the feelings trying to be given in the song. I think, this song is most probably written and performed in 4 a.m. And it should be listened at the same time just before going to bed. It is soft, peaceful and strong at the same time. There are lots of surprises in piano partitions. Mohammed Goes to New York part I: This may be the most unusual song that you can hear in a Scandinavian trio album. It is actually an intro for the second part. What we hear is phonically an equivalent of Ezan, which is performed by İmams from the mosques in İslamic countries just before the namaz to call the Muslims to the mosque. There are some Arabic words in Ezan, however what we hear in that song is just a cry resembling to Ezan. I do not have certain ideas about what İslam means to the E.S.T. and why they choose such a name to their song but I think this piece has something to do between East and West. By the way, the vocal used for Ezan is perfect(by Magnus). Mohammed Goes to New York part II: A strong entrance of snare drums followed by bass and piano links the first part to the second with an increased tension. I think in the first part, Mohammed is in Arabia; whereas he is in New York now in the second part. The aggressive entrance is softened at the middle when the improvisational part began. Magnus Öström is on a journey over the drum set while we hear the wonderful piano of Esbjörn. You can hear his voice while playing, because he feels the music deeply in his heart. You can see the same habit in important jazz pianists such as Keith Jarrett and also in classical pianists such as Fazıl Say. I should add that the main melody of the song is very well composed. Please give attention to the percussion movements of Magnus Öström. Waltz for The Lonely Ones: Here we come to a very slow tempo jazz song. Magnus Öström is very famous around jazz listeners with his sophisticated brush usage. You can understand easily why he is so in this song. It is very difficult to improvise such a slow song especially with the piano but Esbjörn is very good at it. The touches of Magnus Öström is very soft and never become dominant as expected. The synchronization between the members are just perfect. This piece can also be listened in one of Lina Nyberg's albums with Esbjörn Svensson with a vocal addition. Silly Walk: A fast swinging jazz song is introduced by the dialogue between piano and drum&bass. After this introduction they decide where to go. The bass and drums carry out a walking line while the piano is improvising the main theme. The tension that E.S.T. gives to you is just incredible. I am not sure whether you are ready to take it! Though Though: The entrance of this song is one of my favorites. Esbjörn just put his hands on the piano then we hear two small expression/words that I could not identify the sources yet: “You Bet!” and “All Right”. I think this is a bet between the trio members just before the performances. This can be the reason for all endless improvisational partitions. Drum and bass leave the main line from time to time to control the tension. Just listen to the perfect harmony between them. For some intervals near to the end, Esbjörn leaves Magnus and Dan alone and after that he plays the main theme. Hands Off: A gradually increasing (most probably played by hand) snare drum rhythm is followed by a lyrical piano and a soft (mid frequencies dominant) bass. Main theme is sometimes played by piano and bass together or the bass alone. This is a great last song which leaves you with a peaceful heart and mind.